Are there reports of misconduct that may be missing? Does fear of retaliation encourage external reports of misconduct, undermining your compliance programme? Here are a few insights from the metrics. Download the report to see all the takeaways! Reports of harassment and discrimination increased. 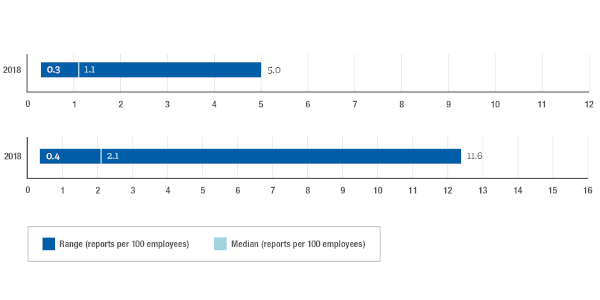 We published year over year data for harassment and discrimination reports for the first time this year. The impact of the #MeToo movement is evident in our data and matches the EEOC trends. Web and hotline reporting channels aren’t enough. Organisations that documented reports from “all other methods” —such as open door, email, manager submissions, and mobile—captured 91% more reports than organisations collecting reports through web and hotline channels alone. Case closure time improved this year. Improvements to the HR, Diversity and Workplace Respect category drove overall improvements. However, this metric is still well above our best practice range. Get access to read the full report and see all the critical metrics and analysis by filling out the form now!